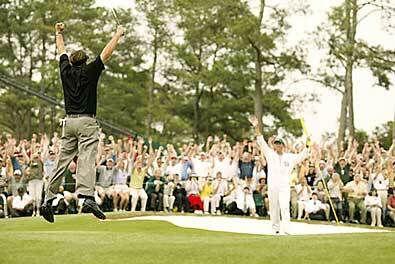 I watched Mickelson's final nine holes in the Masters Sunday. What a final day--hole in ones within moments of each other on the same hole, Choi holing out from the fairway, Ernie and Phil destroying the back nine. And, from a presentatiopn perspective, CBS HD rocked. I hadn't watched the Masters in high-def before, and I'm never going back. I felt like I was there in the crowd on that last putt, and I was jumping around in my basement when Phil's Titleist Pro V1 reached out and grabbed the left edge of the cup with its arms and pulled itself in head first. Phil seems to have crossed some barrier. He was locked in that last nine--I've never seen him play better. Right now, Tiger has two formidable competitors in Phil and Ernie, and Vijay is just a notch below. I'd love to get my handicap down to the next level this year which makes this finger injury all the more frustrating.